The problem with most music today is that it has no soul. Modern country and modern rock both embody the corporate dash for cash, the need to do what everyone else is cashing in on in order to get your piece of the pie. 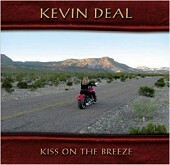 Kevin Deal, though, embodies the other half of music, the half that does it because they love it, never caring whether they're going to be playing for beer money or playing for millions. People like Deal play for the love and enjoyment out of it. It's in their blood; it is their blood. That is why Kiss on the Breeze is such a good ample. Smothered in dusty trails, warm sunshine, and promise of a bright tomorrow, Deal's country is that of an American man who makes his living using his hands, either playing his guitar or working his fingers to the bone like every other blue collar American out there. This is blue-collar country, the way country should be. Tender, loveable, and sincere, Deal leaves you craving nothing except another album filled with more powerfully compelling, exquisitely written songs. I'll give it an A.